I am sharing tips and ideas on How To Manifest a Family Meal. You wouldn’t think it’s hard to do but when schedules, activities and work comes into play, you need deliberate action and mindfulness to bring about meal time with family. 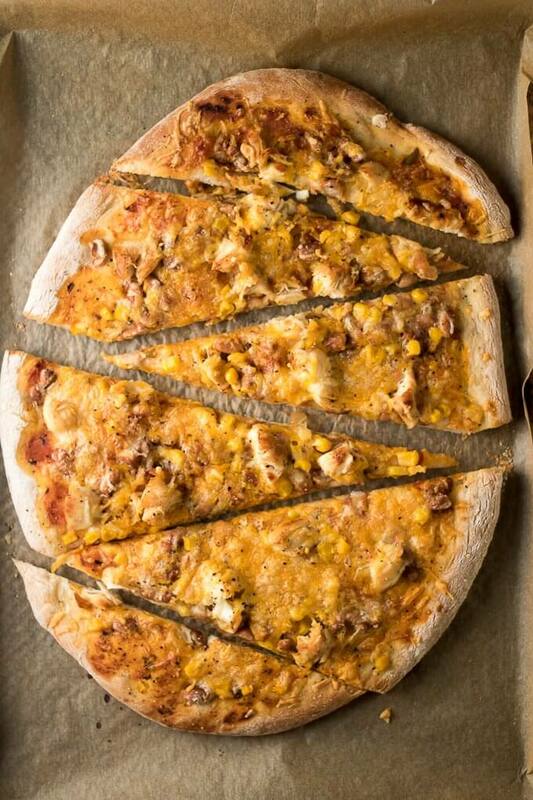 Plus, with some help from ShopRite, I’m sharing my savory, delicious & family-friendly recipe for Chicken Taco Pizza! Hi Everyone, it’s Autumn and everyone’s schedules are either already packed or about to get even more busy as we approach some of the biggest holidays of the year. No matter what time of the year it is, sometimes it can be a challenge to gather the family around the table to share a family meal. I want you to know that even though it can be a challenge, it does not have to be impossible and if you can set up your schedule and be mindful about certain things, a family meal together with loved ones can be achieved. I just want to talk a little bit about why this is personally important to me. We now have a family of 4, my husband Eric and I, our 4 year old daughter, Margo and the newest addition to the family, our 1 year old son, Marc. Eric works full-time outside the home, I am a stay-at-home/work-at-home mom with my blog/food photography business, plus, I have a new part-time job outside the home. Our daughter has preschool a few days a week with seasonal sports & activities and our son has all the needs of a baby/soon to be toddler. Let’s just say we have a busy household with the potential to always get busier. If we want to have any chance at having a meal together, we have to make it happen! 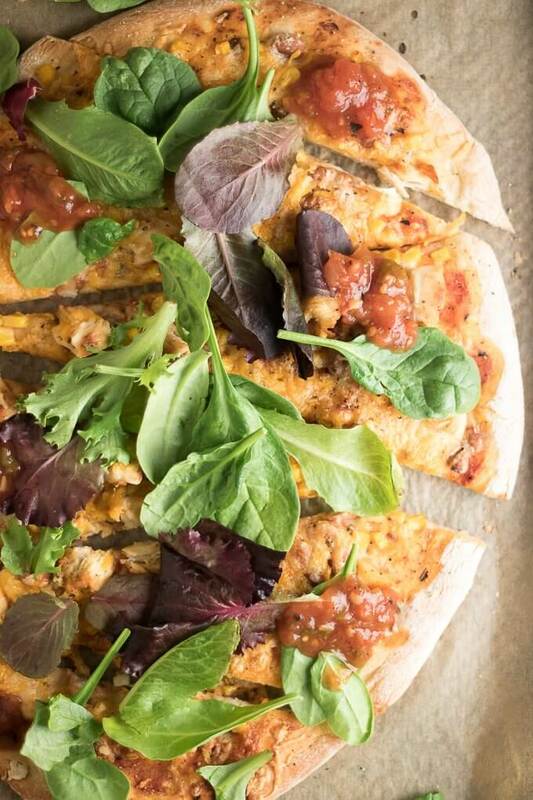 I am sharing some tips from my household on what’s working to manifest a family meal for us, plus I am sharing an adaptable, family-friendly meal: Chicken Taco Pizza! It’s important to set either an exact time or general window of time to have your family meal. Deciding whether or not to have an exact time or general time can depend on your preferences or the schedule/activities of the day. For us, for example, it’s usually, 6:30 pm BUT this is always subject to change depending on the activities of the day. Sometimes it’s later, for example, if we are at the gym or taking a walk, sometime it’s earlier. It also depends on the season since it gets dark earlier in the Winter months. Make sure everyone in the family knows what the meal time is, so everyone can be together in the same place at the same time. Communication is key! 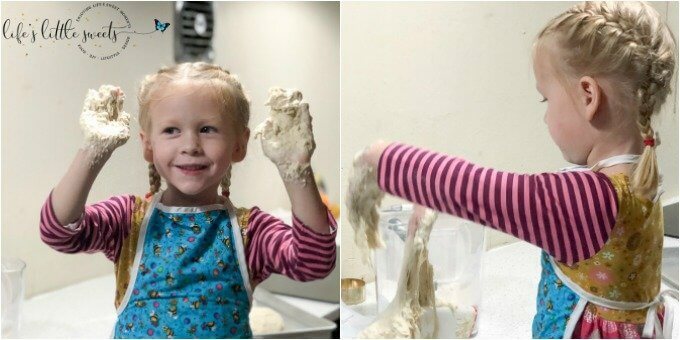 Here, my daughter is “assisting” me in making pizza dough. She clearly loves this part of dinner prep! Make sure your day is not over-burdened with activities to the point where you don’t have time to prepare or have a meal with your family. Try not to schedule activities/appointments too close to meal time and give a buffer for that sacred time. This is jumping ahead a little bit but try to get everyone involved in cleaning up and beyond that doing a nightly clean up helps give you a clean slate for the next day. The more you can prepare ahead, either with household chores or meal prep the better. If you find yourself with a window of time, use it to clean & organize and that can do wonders for making things less chaotic and more calm. 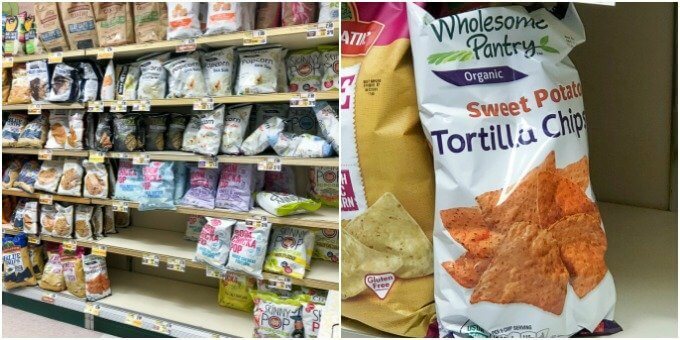 Some items from my ShopRite grocery haul. 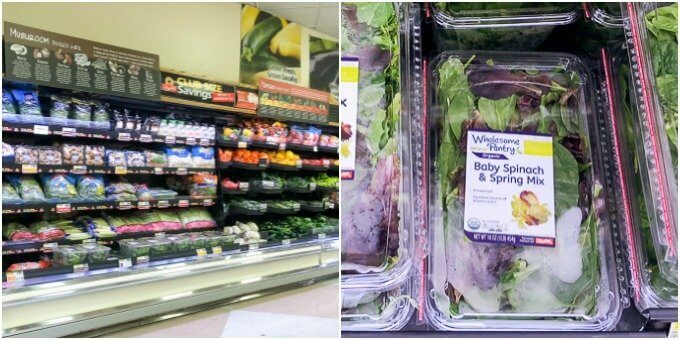 I found the Wholesome Pantry Baby Spinach & Spring Mix in the produce section. 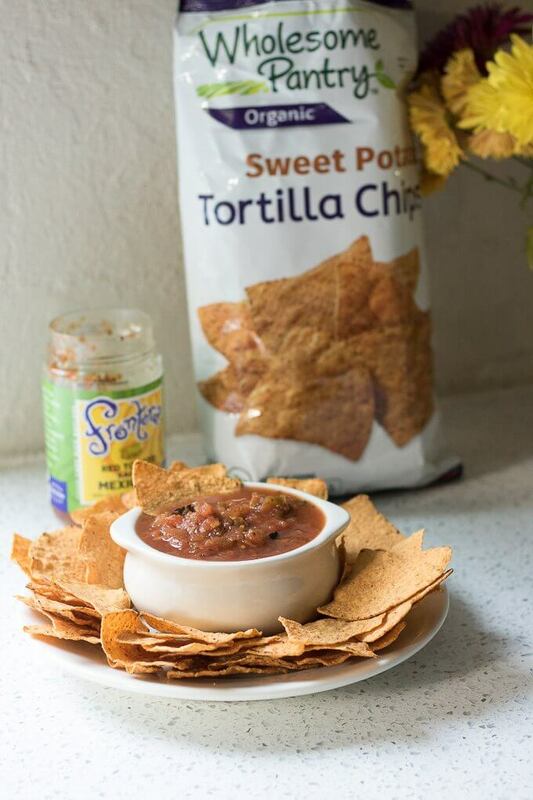 I usually have chips and salsa (a family favorite!) or something people can snack on while dinner is being prepared. It also has the added benefit of getting your family members to stand around and start talking. 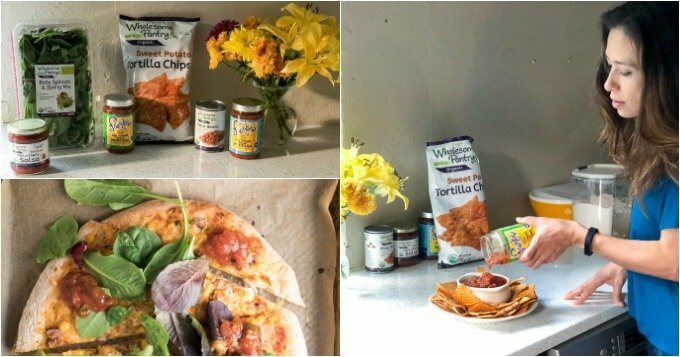 We tried these Wholesome Pantry Organic Sweet Potato Tortilla Chips with tasty Frontera Salsa as a starter with our Chicken Taco Pizza which complemented the meal as well as being something new (sweet potato) for our daughter to try. 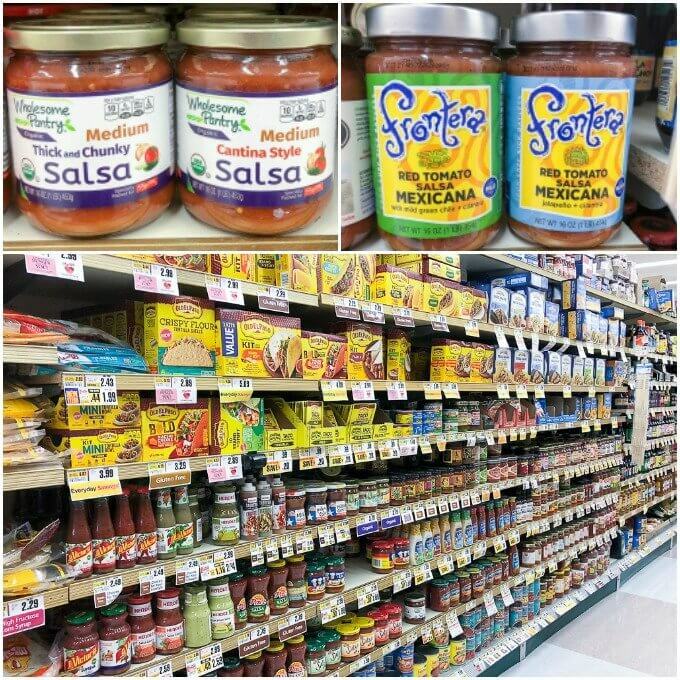 I found the salsas in the Ethnic foods aisle. 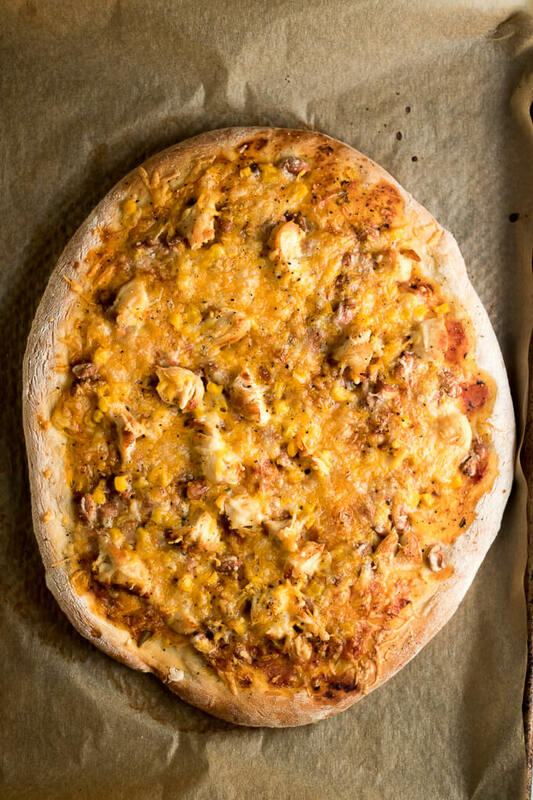 This Chicken Taco Pizza is a savory and balanced meal that tastes great, is adaptable for every family member (adults and kids alike) and best of all comes together in a reasonable amount of time (a bake time of 15-20 minutes). 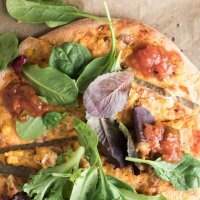 This recipes uses my recipe tutorial for How To Make Pizza Dough, but you can take a shortcut by getting store-bought pizza dough. If you can prepare the dough the day before, that helps cut down the time it take to get dinner made too. I always make an extra pizza dough recipe so I can have pizza dough for the next day. This recipe has chicken which can be omitted for vegans/dairy-free eaters. 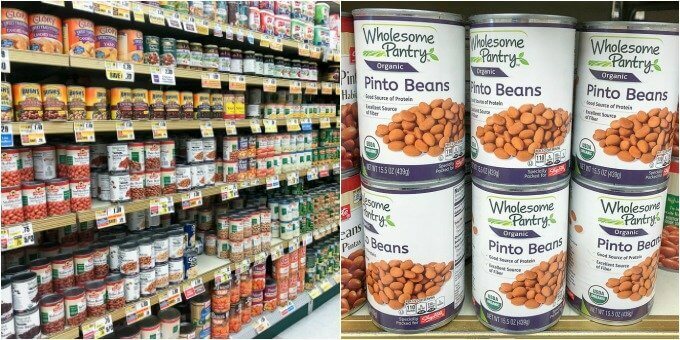 It has pinto beans which can be swapped out for another kind of bean. You can also customize the type of cheese blend. I used a 3-cheese Mexican cheese blend for the topping. After it’s done baking, I just sprinkle it with prepackaged Spinach & Spring Lettuce Mixed which is already washed and ready to go (another time saver!). 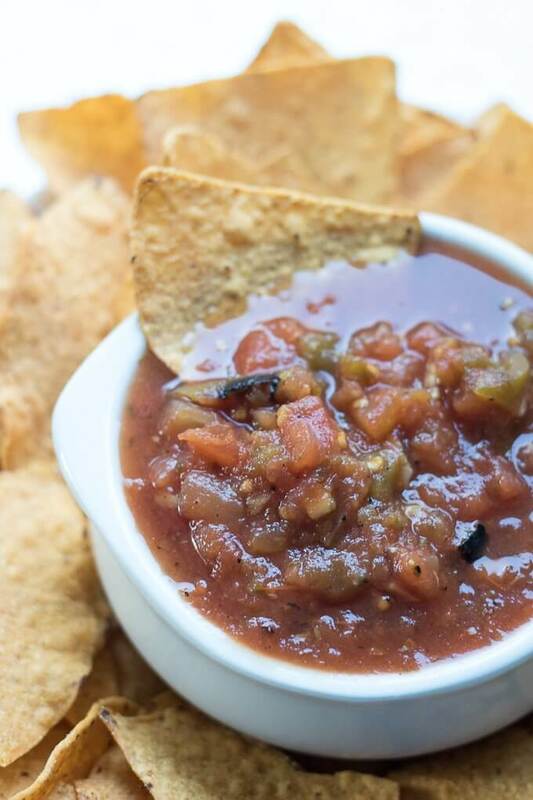 I also dot the top with more salsa before serving for some extra fresh flavor. Meal time is the one time of the day to reconnect and focus on your family, make it count! 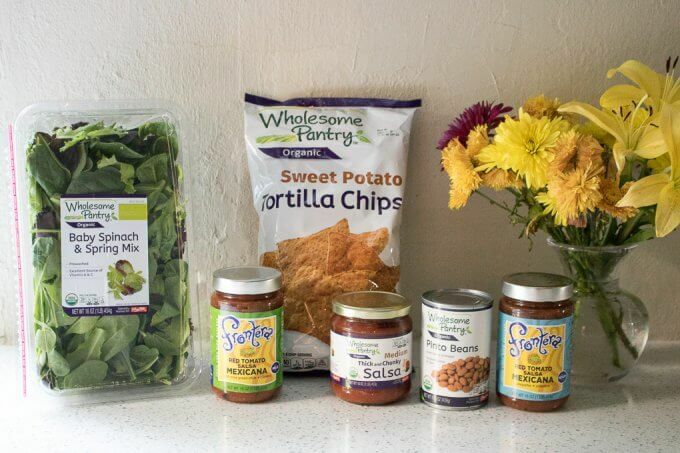 Let me know how you make time for family meals and recipes that work for you in the comments below, thank you! 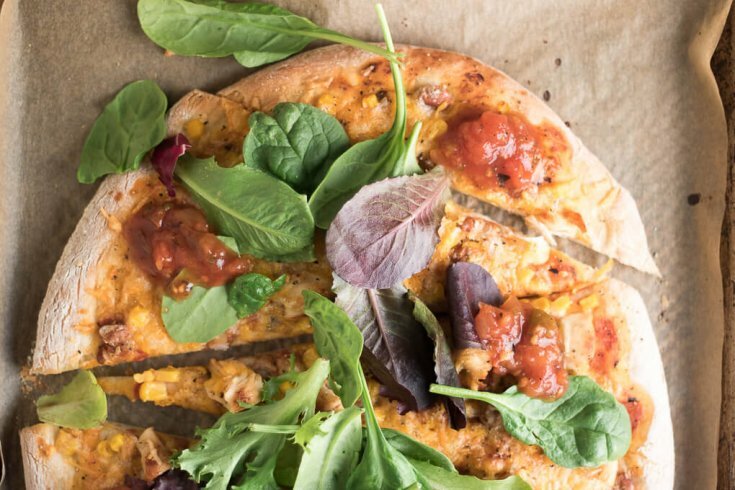 Family-friendly and delicious, this flavorful Chicken Taco Pizza is sure to please children and adults alike. 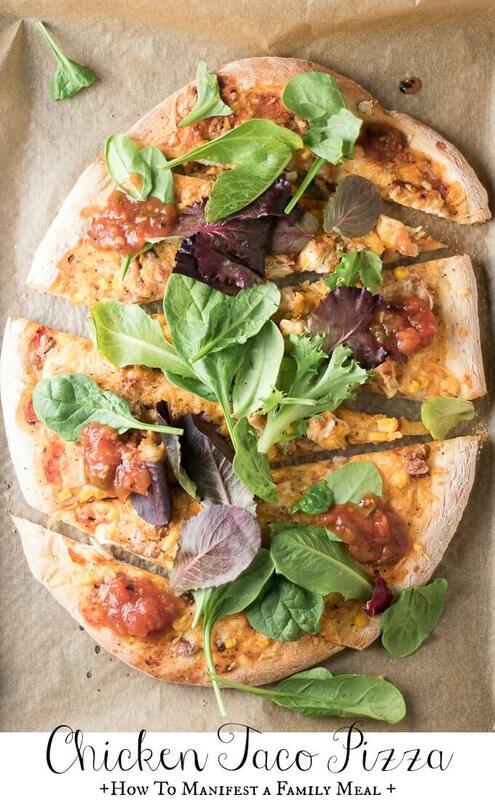 It has a salsa base, cooked chicken, Pinto beans, Mexican 3-cheese blend and is topped with spinach & Spring Mix greens and more salsa. 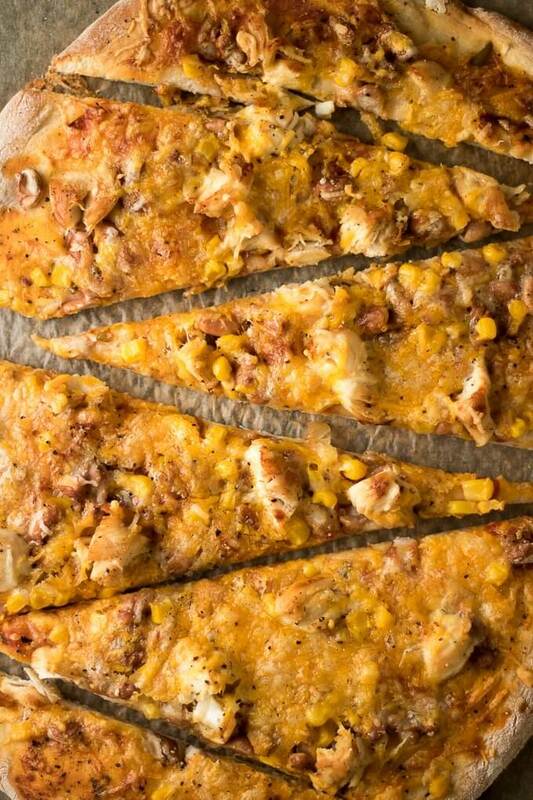 Try this adaptable and easy pizza recipe! Form 2 pizzas (or 1 large pizza) with the pizza dough. 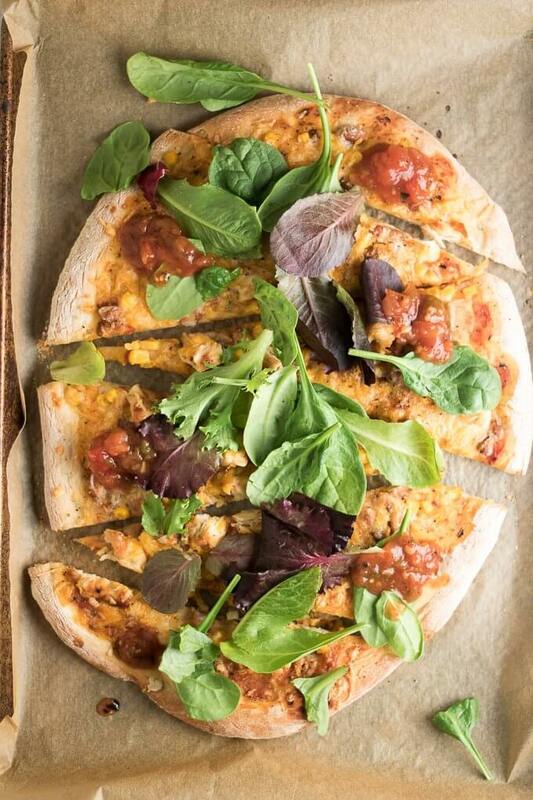 Spread 1/4 cup salsa on each pizza. In an even layer, add Pinto beans, about 1/4, per pizza to the salsa layer. Add chicken to the beans layer. Add 1 cup (or amount to taste) to the chicken layer. Sprinkle in an even layer. Bake in the 450 degree, preheated oven for 15-20 minute until cooked through. Sprinkle 2 ounces (or amount to taste) of Spinach & Spring Mix to the top and slice before serving. Enjoy!